Nathan Miller is a painter and photographer formerly located in Nosara, Costa Rica. He is drawn to nature and wildlife. His paintings and photography celebrate the magnificent beauty of the natural surroundings in Costa Rica, such as "Keel-billed Toucan," and "The Siesta," shown here. The Keel-billed Toucan is one of the more colorful creatures you will find flying free in the Costa Rican sky, or perched upon a branch in the lush mountains enjoying the view. The Howler monkey, while playful and social creatures, also find the time to relax under the shade of their favorite mango trees. "The Siesta" depicts a howler monkey doing just that. Perched way up on a tree limb. Come in to see his Costa Rican work. Miller's pieces are also available as giclée prints. 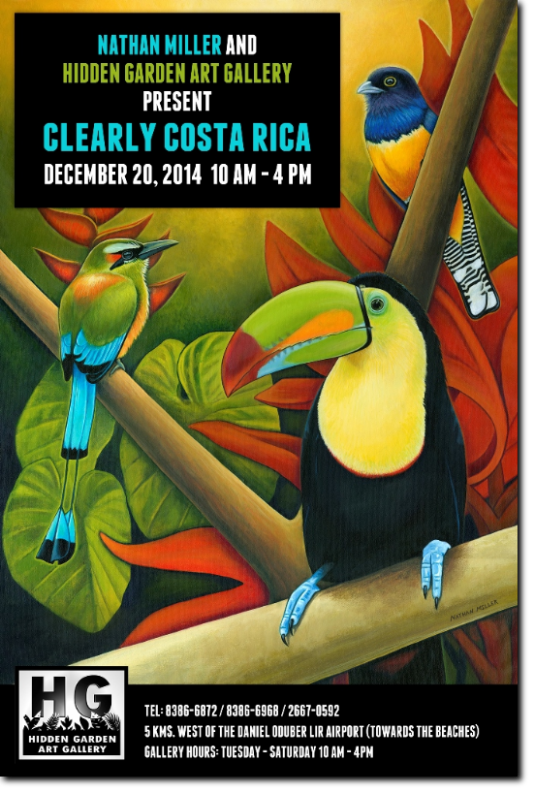 Read about Miller's art exhibit, "Clearly Costa Rica," in A.M. Costa Rica, here. See the slide show from the opening of "Clearly Costa Rica," here.